What is T'ai Chi Chih? The simplicity of execution and the realization that something real and immediate is happening is what attracts students to training and regular practice. The short list of Features identifies some reasons why TCC is a great choice for those seeking the Benefits one can expect from regular practice. It is relatively easy to learn. It can be practiced almost anywhere. It can be practiced alone or in a group environment. Requires no special clothing or equipment. Effects can be felt rather quickly. Conducive to active lifestyle and mindset. Justin Stone wrote, “In the rush of our busy lives…we find it too difficult to sit quietly and do sitting meditation; the mind that has been racing all day is not going to suddenly turn off, though breathing exercises will help quiet the mind. Ah, but we can move, and find it pleasant to move softly and rhythmically. 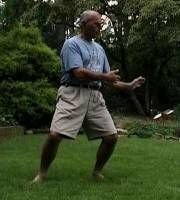 With the gentle movements of T’ai Chi Chih®, even if we do only a few of them repetitively, comes a quieting of the emotions as the Chi (Vital Force) circulates and is then balanced.” -- from Spiritual Odyssey, Justin Stone, comments on “Culture of Discontent”. Benefits – TCC students experience physical, mental, and emotional benefits, often speaking of other personal benefits. Practicing TCC permeates all aspects of human character, helping us to discover more about ourselves, to become better people, and to enjoy life more. Those who practice daily often notice significant changes during their first few weeks. Each person’s experience will be unique, depending on how he or she approaches TCC practice. Physical - Positive physical impact is often realized, though TCC’s purpose is not to build physical strength or endurance. Practicing TCC does affect the inner organs, nervous system, as well as the muscular structure. The soft movements can have a demonstrable effect on circulation, physical balance, control, and aspects of attitude. Mental - The benefits of regular practice are cumulative. I feel mentally strong and able to focus. Experiencing calmness with increased energy allows for deliberate planning and execution of the day. Developing the habit energy of regular practice makes it easier to strengthen other good habits and to question and reduce involvement with non desirable activities. Emotional - TCC impacts well being by helping to calm the mind, carving out time to heal and refresh ourselves, to release negative tensions and feelings, and prepare us for interactions of the day. Feeling better able and more eager to handle the challenges of the day impacts attitude and personal relationships. Practicing TCC can lift a tired body and a sagging spirit. Spiritual - TCC transcends all religions and cultures. While improvements in our lives are influenced by many factors, regular TCC practice stimulates and accelerates positive change, benefiting those practicing TCC and the world that we live in. Many who practice TCC sense a deepening of their spiritual awareness. TCC is compatible with and supportive to spiritual discovery. Physical: Improved circulation, balance, coordination, stamina, flexibility. Mental: Calmness, energy and enthusiasm, confidence, and clarity of thought. Emotional/Social: Connection with like-minded people, rejuvenation, improved relationships. Spiritual: Openness, appreciation for life and the power of the universe. As you practice, move, flowing from the center, the benefits become evident.